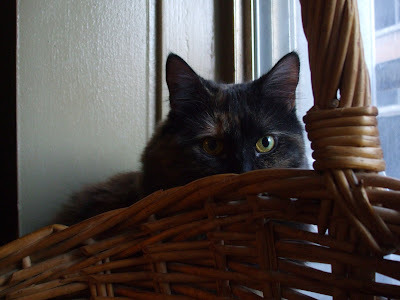 This weeks Tortie lesson is in lurking. 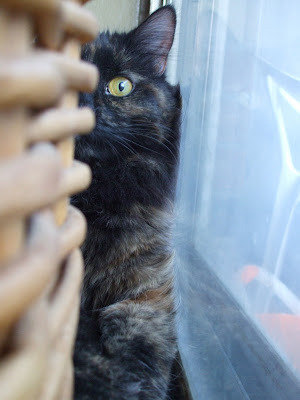 The difference between lurking and hiding is that with lurking, you actually want to eventually be discovered to intimidate your prey(we will discuss intimidation in an upcoming Tortie Tuesday) but only after it's too late for them to escape. Contrast in colors between your body and the area you are lurking in adds a nice touch of shock to the prey's initial horror at discovering the lurking Tortie. Imagine a mouse who innocently turns around and sees this staring back at them! Another important factor for successful lurking is the expression on your face. I find the most effective way to produce terror in prey is to simply use the standard Tortie gaze of pure implacability. This look isn't just merciless; it's beyond mercy! This is the face that the terrified prey will see just before its untimely demise. In this case, I was lurking up on Mommy who is far too large for any domestic cat, even a Tortie, to kill - but you get my drift. This last photo demonstrates the hiding/lurking move - like a spider in a well concealed web. 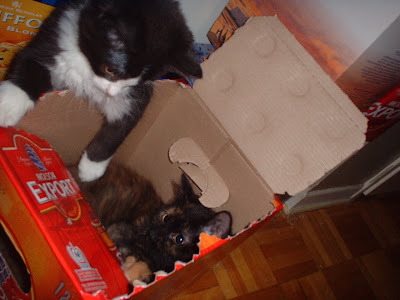 The bug (Samson) bounded upon a seemingly empty box to play in. Imagine his surprise when he peers over the edge of the box to find my unappeasable glare! All this training is to keep myself in shape for the day when real prey dares to enter our home. In the meantime, Mommy, Samson, the Ball Guy and the occasional spider or moth will have to do. That was very interesting Delilah. You make a very good lurker and predator. What a great Tortie Tuesday lessons! We are looking forward to the next one already! You have got that glare down, Delilah! We all found your Tortie Tuesday lesson very informative! You and Maggie May are so much alike! Happy tortie Tuesday! Tasha says "well done!" on the lurking, Delilah. Great example of tortitude! I, ANgel, like to lurk and pounce Kirby. Thanks for the pointers. I love that first photo of you, Delilah! That was a great lesson. We're going to practice lurking! Delilah, you have mastered lurking! I pity the prey who dares enter your domain!